Today, the leadership of DSA banned a discussion on building a working class political party. As explained in this video, I was to make a presentation to the delegates to the upcoming national convention on this issue, but just before that subject came up I was bounced off the video conference call. I’m being told it was because I “left” it but that is untrue. The point is this: DSA could make a real contribution by running candidates for local office as open socialists, as working class representatives, and as being outside of and opposed to the Democratic Party. They could explain that the entire party is the party of the owners of capital – the capitalist class – and that workers need their own party. But they can’t run on that basis as long as they are supporting any of the candidates of that party, much less run on the Democratic ticket. Oaklandsocialist urges you to watch the short video to get a more in-depth explanation of the politics involved. The reason the DSA leadership removed me from the discussion is that it is so blindingly obviously true at this point, but they are committed to maintaining the ties with the liberal/”progressive” wing of this party of the bosses. I hope members consider these points and insist on a discussion on them. For a more in-depth view of DSA, see this article. Also see this article for a review of four activists who are running for local office outside the Democratic Party. The top e mail was how my proposal was originally going to be presented. The middle one is after I corrected the original one. And the bottom picture is what was presented at the conference call. Notice anything missing? Well, guess I won’t join them then. I’ve had enough of liberal sheepdog organizations to last me 100 lifetimes. I urge socialists to join DSA. It is in the process of being transformed, having gone from some 6,000 members to over 20,000 in less than a year. At least some of these new members are seriously looking for a way to fight for socialism. No one said revolution would be easy or the correct path clear. If they did they were lying or overdosed on optimism. I’m not a member of DSA. But it has occurred to me that since the DSA isn’t really dependent on large benefactor money, the DNC can’t really control it unless actual socialists don’t join. Unless you know otherwise? I agree that actual socialists should join DSA at that time. There is a problem, though, and that is the influence that the union bureaucracy seems to hold over DSA. They represent the Democratic Party within the labor movement. This has to be opposed. I am a SF Bay Area member of the Socialist Party USA, which runs our own campaigns opposed to Republicans and Democrats and for ownership of the means of production and elimination of all hierarchies. We have a local chapter here. We also allow for dual membership with DSA. If anyone wants to get in contact with us you can email me at tinarphillips@yahoo.com. This e mail address does not work. 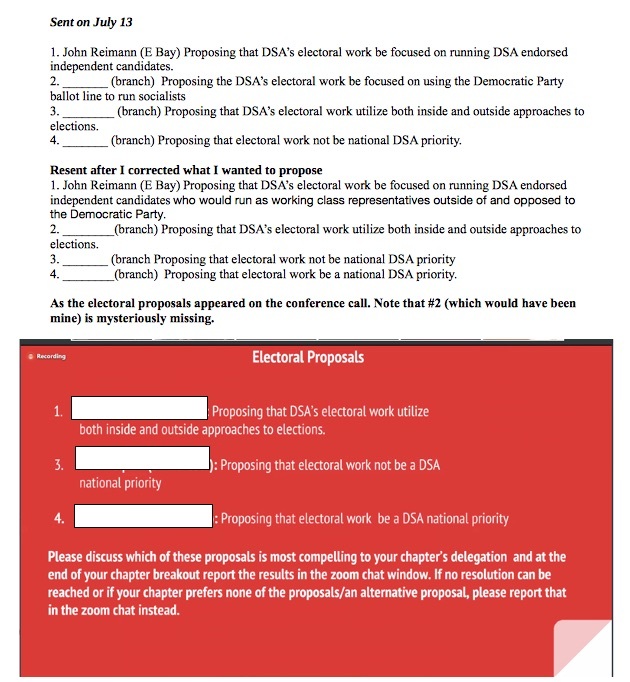 I don’t share your optimism that the DSA organization itself can be a vehicle for a worker’s party, but I also don’t think its right to write off all of their members as stooges for the Democrats either. I do think that your post is useful, and its useful to talk and engage with their many lower level members who want something more than the Democrats, which could encourage a split–(which can be good). But a split must be a principled one that moves things forward, differentiating itself, contrasting itself from the former by its loyalty to the interests of workers and not merely a copy cat with a different color. Two DSAs are not better than one. Moreover, a split would require a confrontation and exposure with national leadership, which new members must be prepared for. I’m not involved with the DSA so I cannot judge how feasible that kind of outcome is. And my thoughts on the DSA can be said for many social democratic organizations, but as a lone, independent voice I think that encouraging such an outcome while good–it might be a waste of your time without independent organization. With only one lone voice, it likely won’t be FEASIBLE. In my opinion, I don’t see much difference between this kind of solo effort and one within the trade unions. Its good to expose the problems and limitations of the social democratic political parties, but what do we have to offer as an alternative? How do we train our own and expand our influence as Marxists? Do we do it by capitulating ourselves to their organizations? How do we build our own independent influence in an effective way? John, you have a strong reputation with many proletarian activists who want a working class party John. Can you write something to unite them? Many working class activists around the country respect you, and while we may not all be in agreement on many things, the necessity of building a mass organization is real and it binds us together. The necessity to overthrow the ruling class of capitalists is real, and to transcend capitalism is real. You’ve spent your whole life building this credibility whether you recognize it or not. Why not make a feasibility study to organize an independent Marxist organization? If you call for such a meeting, even just to discuss it and come to some agreement, I would gladly set aside some time. I think others would too. But if you asked me to devote more of my time to building the DSA than a Marxist organization, I will have to decline. I would only spend much time in such an organization if there were some kind of a serious PLAN and a REAL organization for workers however small that has my back. Thank you for your comments, AF. In this confused period, completely unexpected things develop. That was the case for the Occupy movement, for example. Now, what seems to be happening is that thousands and thousands of young Sanders supporters are entering DSA, as i wrote in another article. What are they looking for? How far are they willing to go? Are any of them open to real, revolutionary socialist ideas? I doubt any of us knows, but I do think we have to find out. I really don’t know where all of this is headed. As it is, as far as I can tell, DSA is overwhelmingly middle class youth. If there were an organization/movement with two or three thousand, never mind 21,000, working class socialist/activists – but real working class ones – then I’d be there. But there’s not. So, no, I’m not working towards a “split”; I’m simply trying to raise some of the key issues that I think confront the working class and socialists at this particular time. As far as organizing an “independent Marxist organization”: It depends first and foremost on how we conceive of the tasks at hand. As I’ve written, I think the first step right now is to try to get real working class socialists to run for local office on an independent basis. That would be a great first step. I recently asked a DSA member on twitter how a socialist running under the Democratic Party ballot line avoid not being drawn into the party machine and moving right. He told me the results vary and it depends on keeping them accountable. I am not entirely sure what this means. Do you have any light to shed on that? He also said that locals are free to run candidates however they want. Do you believe that the national org should mandate that all chapters must run all their local candidates opposed to the democratic party, as open socialists? Syed, thank you for your comments. In his own way, Trump is proving my point. Ultimately, anybody in elected office needs to have her or his own “posse”, their own organized group on which they can rest. This is what a political party is. So, if an elected official starts out unclear on this and if those around them aren’t clear, given the enormous pull of the Democratic Party (assuming the official is some sort of left winger), they will inevitably get drawn in that direction. We’ve even seen that in the case of socialists who started off opposed to Democrats. I’m referring to Kshama Sawant, who is getting drawn closer and closer into the Democratic orbit. No, I don’t believe the national org of DSA should mandate that all chapters must run local candidates as open socialists opposed to and outside of the Democratic Party. What I do think is that they should urge the chapters to do that. That’s not going to happen because it’s not the position of the national leadership nor, most likely, of the great majority in DSA. So, what my proposal suggested was that the national leadership open up a discussion, encourage the local chapters to hold meetings/debates on the issue, even send representatives of the national leadership to the local chapters to help in having such discussions. What do you think of those ideas? While all political activity that the DSA is doing now is tempting for Class conscious Marxists, one must always remember that this formation comes out of the same bunch that kicked Jack Reed and the Left Wing OUT of the Socialist Party for WINNING the election!